Hanoi (VNA) – Hanoi wants to work with Hungary’s capital Budapest on environmental issues, relics preservation and tourism development, according to Vice Chairwoman of the Hanoi People’s Council Nguyen Thi Bich Ngoc. 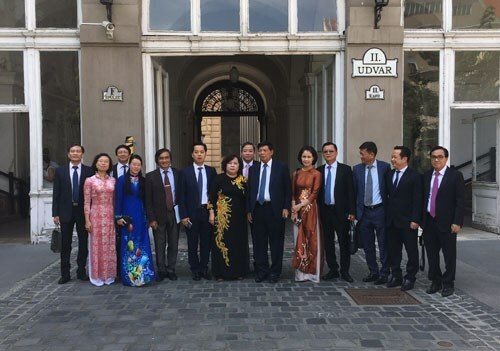 Ngoc, accompanied by Vice Chairman of the Hanoi People’s Committee Nguyen Quoc Hung, visited Budapest on August 1-2 where she met with the city’s Vice Mayor for City Development Szeneczey Balazs. During the meeting, she asked Budapest to increase delegation exchanges between the two cities and boost cooperation with Hanoi, particularly in environmental treatment and producing clean water from the Red River’s surface water. Hanoi also hopes to learn from Budapest’s experience in tourism development and relic preservation which will be beneficial for its restoration, protection and management of cultural and historical relics. Additionally, Hung discussed riverside urban planning, constructing overpasses and solving traffic jams with senior officials from Budapest. The two sides also talked about enhanced partnerships in information technology, management of residential databases and building public spaces. For his part, Balazs gave his guests an overview of the city’s economic development, cultural relics, transportation, urban architecture and social welfare.